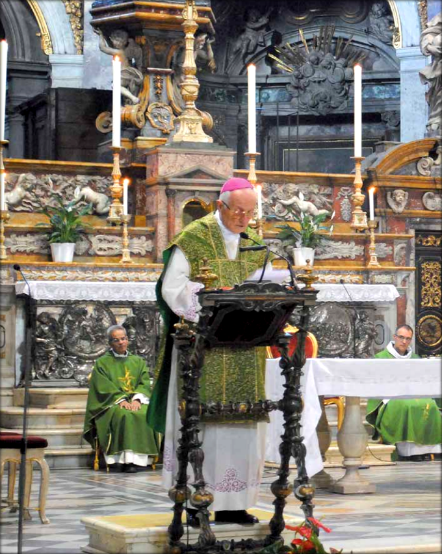 Archbishop Nuncio Apostolic Pier Giacomo De Nicolò, Papal Nuncio in several countries, gave a homily at the Basilica of the Annunciation in Florence, Italy, where Maria Valtorta is buried. This was given on October 15, 2011, on the occasion of the 50th anniversary of Maria Valtorta’s death. 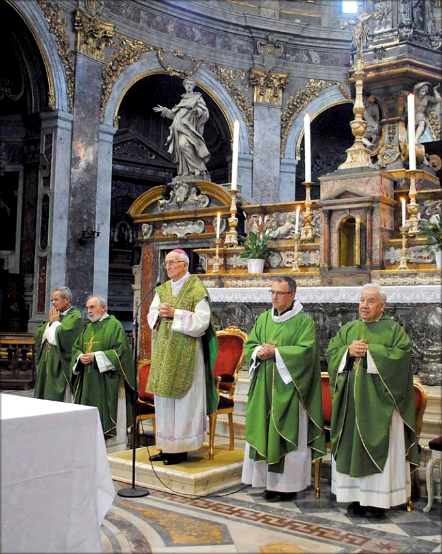 There were three Masses offered for this occasion (two on October 12 and one by the Archbishop on October 15), as well as a Valtorta conference and respects paid at her tomb. Below is video footage which shows parts of the conference and of several of the Masses offered for the event, followed by an English translation of an excerpt of Archbishop Nuncio Apostolic Pier Giacomo De Nicolò’s homily about Maria Valtorta, followed by additional photos. Here is video footage of a Mass offered on October 12 at the tomb where Maria Valtorta is buried in honor of the fiftieth anniversary of her birth into Heaven (October 12, 2011). This video showcases parts of the Mass, people paying their respects at Maria Valtorta’s tomb, followed by footage from a Valtorta conference which took place on October 15 where there are talks given by numerous people about Maria Valtorta, her life and writings, and the tremendously good fruits her works have produced in countless souls. The speakers included an introduction by Fr. Gabriele Allessandrini (Convent Prior of the Order of the Servants of Mary in Florence and Rector of the Basilica of the Most Holy Annunciation), and then talks by Dr. Emilio Pisani, Professor Don Carmelo Mezzasalma (Prior of the Community of San Leolino in Panzano, Florence), Fr. 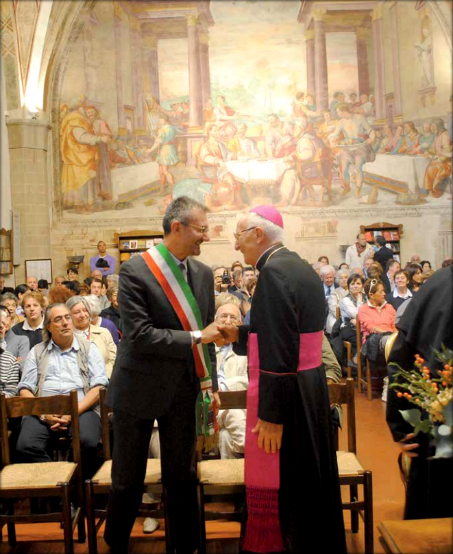 Gabriele M. Alessandrini, O.S.M., and Fr. Giuseppe M. Galassi, O.S.M. At the end, Archbishop Nuncio Apostolic Pier Giacomo De Nicolò led a song to the Blessed Virgin Mary. Later that evening, Archbishop Nuncio Apostolic Pier Giacomo De Nicolò offered Mass in the Basilica of the Annunciation in Florence, Italy in honor of Maria Valtorta during which he gave his homily, an excerpt of which is translated below. 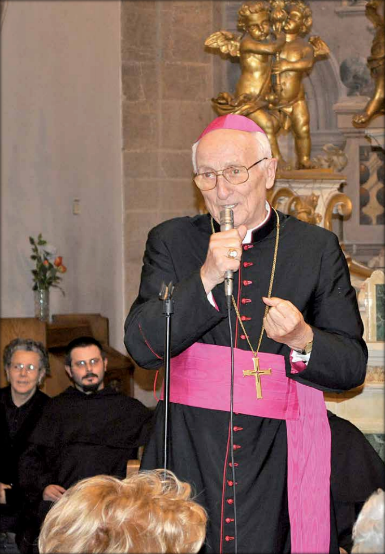 The below video includes the beginning of his homily and his entire homily is printed in Per Maria Valtorta Nel Cinquantenario Della Morte (1961-2011) by Fondazione Maria Valtorta CEV Onlus. Archbishop Nuncio Apostolic Pier Giacomo De Nicolò, Papal Nuncio in several countries, gave a homily at the Basilica of the Annunciation in Florence, Italy, where Maria Valtorta is buried. This was given on October 15, 2011, on the occasion of the 50th anniversary of Maria Valtorta’s death. Below is an English translation of an excerpt of his homily. In this homily, it is to be noted how much this Apostolic Delegate approves of Maria Valtorta’s life and writings, as well as the insightful comments he makes on her life, the spreading of her works, and the good fruits that they have produced in countless souls. …In carrying out the reflections mentioned, in the light of the Holy Spirit – which have always been given to us if asked with peaceful and persevering humility – our thoughts would spontaneously return to Maria Valtorta, retracing her path on this existential walk. In the passages of divine pedagogy, which are particularly eloquent, the creature aimed at attaining a full and vital communion with her Lord: an instrument, initially with no intrinsic value sufficient for a task of such elevated importance, chosen for a mission of redeeming salvation that would surmount by far any human possibility. Maria responded to the call with the heroic effort of theological virtue that allowed her to surpass the dark night of purification, at the same time making it possible to receive special gifts for the benefit of her fellow man. However, these are accompanied by a growing and definitive identification with the cross of Christ under the impulse of genuine love, drenched incessantly with pain in order to unite herself to the redemptive work of her Jesus. Examining the stages of this woman’s life which is rich in consistency, courage, strength, dedication, and prudence, a victim hidden in silence and incomprehension, it was still not complete at this time. We note only that her natural talents cannot explain what she accomplished with rather moderate general knowledge and without any adequate means of consulting references. In each stage, the light was always her Faith; in every difficulty and pain, her Hope never lessened and she never gave up. The inner spring of her ascetic vitality and of her mystical life in union with the Lord was the Charity that transfigured every human feeling and aspiration. Maria reached a heroic level of trust in God, that loving trust that can only open the Heart of her Beloved desiring to bring down His graces into the heart of man. Initially, she was distressed by how quickly humans revoked the soul’s fulfillment that the world cannot satisfy. After this stage, she became all of the Lord, and even on the Cross, she relished the happiness because she was now aware of having the One who loved her with an absolute love she yearned: the infinite love of her God, her Spouse and her Jesus. This is how she became the “instrument”, “the means”, “the pen of the Lord” as she liked to refer to herself. On the other hand, she wanted to remain hidden and unknown in life – this is an unmistakable sign of the authenticity of her charism – and she suffered enormously when the innocent indiscretions of her spiritual director would reveal her to the world. She felt she was all for the Lord, she reserved all praise for Him, and each day she wanted to “render to God that which is God’s” namely, herself completely. Concerning her work as a mystical writer, it is evident that the final judgment belongs to the Church, although in cases such as this, consideration made on behalf of qualified ecclesiastical bodies predominantly concerns the sanctity of life: examples in this regard are well known. And it is on such existential holiness that our reflection is addressed. However, the work of Maria Valtorta – which is free from error of doctrine and morals as noted by multiple parties – recognizes for more than half a century, a wide and silent circulation among the faithful (translated in about 30 different languages) of every social class throughout the world and without any publicity in particular. The grandeur, magnificence, and wisdom of the content has attracted numerous good fruits and conversions: even people immersed in the whirlwind of life and far from the Christian Faith, but nevertheless yearning to get in touch with solid truths, have opened their hearts to a meeting with the Absolute, with God-Love, and they have found full confirmation of the 2,000-year-old teaching of the Church. Today’s society in general, is experiencing a deep crisis of faith. It seems to have gone back to the origin of mankind: the temptation of building a world without God is great and, therefore, without a future. The Holy Father never ceases to repeat: “We live in a time that is broadly characterized by a subliminal relativism that penetrates every area of life… [that] becomes aggressive when it opposes those who say that they know where the truth or meaning of life is to be found.” For this reason, the faithful are called to offer a more authentic and credible testimony, becoming the light of the world. To achieve this very great outcome, there is the admirable example that Maria Valtorta has given, and the even more solid support she will be able to give in the future; and even if some doubts and obscure misunderstandings still hover in the Valtortian skies, those of us together here present, will form the vital auspices that these will be quickly dispelled. Our prayer in this Eucharist will also be offered up directly for this purpose: it will be a fervent and trusting plea Ad Majorem Dei Gloriam – For the Greater Glory of God. Amen. Archbishop Nuncio Apostolic Pier Giacomo De Nicolò is not the only archbishop who has approved, endorsed, or praised Maria Valtorta and her work. Click here to download the list of the above-mentioned Bishops, Doctors of Theology/Divinity/Canon Law, Saints/Blesseds/Venerables/Servants of God, university professors, and noteworthy lay faithful. Testimonies, statements, and documentation for every one of the above listed clerics and lay faithful are provided in A Summa and Encyclopedia to Maria Valtorta’s Extraordinary Work in the subchapter of the e-book entitled “Proof by the Testimony of Countless Trustworthy Clerics, Authorities, Experts, Scientists, and Pious Lay Faithful and the Tremendously Good Fruits Produced in Individuals and in the Church as a Whole”.